#2 – Where Surgical Efficiency Happens. #1 – Where Shabazzketball Happens. #1 – Where Repeat Performance? Happens. 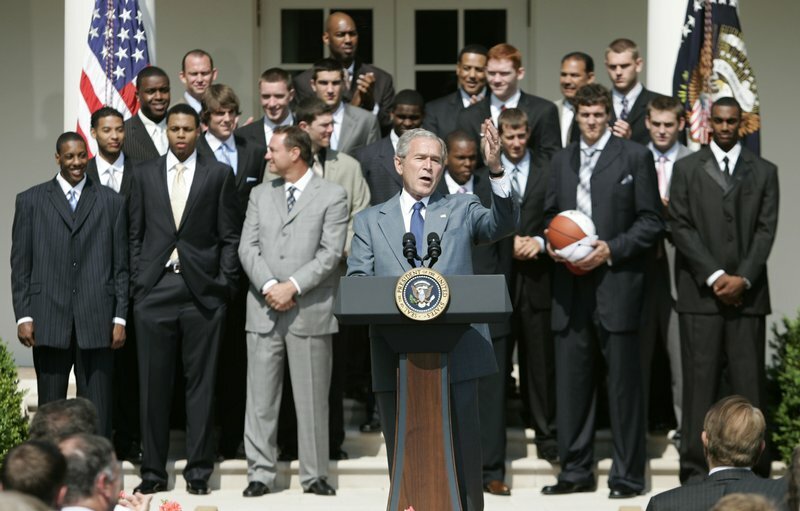 Tuesday was the day for the Louisville Cardinals to visit the White House to celebrate their 2013 national championship, and perhaps the very best part of the entire proceeding was the extremely lukewarm applause at the top that Kentucky senator Mitch McConnell (R-KY) received when introduced by the POTUS. Obama gave his standard spiel of light-hearted remarks during the 10-minute event, referencing how Rick Pitino’s motivational technique of promising to get a tattoo “busted” his bracket and avoiding mention of the “other” school where the head coach won his first of two national titles. Pitino, to his credit, exalted the president while hitting on the themes of loyalty and perseverance that have come to define his teams at Louisville — giving Obama a Louisville Slugger engraved with his name to handle any future disruptive press conferences. For a much more detailed description of the Cards’ visit to 1600 Pennsylvania Avenue, check out Eric Crawford’s report from WDRB.com; and The Dagger has some great pictures that the players and entourage took while there. The entire press conference is at the bottom of this post. While Barack Obama has certainly taken his share of sniping in accordance with his lofty geopolitical position, the NCAA’s Mark Emmert may have taken even more concentrated vitriol from a unilateral perspective (at least the Democrats support Obama; few seem to like Emmert). “One misstep after another,” as one administrator in this ESPN.com piece from Mike Fish and Dana O’Neil describes his three-year tenure as president of the organization. The accusations against the NCAA boss are lengthy, including not only mishandling of both the Penn State and Miami (FL) investigations, but also a general misunderstanding of the desires of his membership and a combative, at best, relationship with the media. It’s a really interesting read about the travails of the organization under his direction, and points again to a burgeoning restlessness among everyone that the NCAA’s days as a serious player on the American sports scene are effectively numbered. One school that certainly has no love lost for Emmert is Connecticut, given that the NCAA banned the Huskies from last year’s postseason as a result of its low APR scores. But, as Adam Zagoria at Zagsblog writes, Ryan Boatright and Shabazz Napier are back in Storrs and ready to make up for a lost season with a major postseason run in 2013-14. Louisville has to be considered the favorite in the spanking-new AAC, but the Huskies are a very interesting second banana. Kevin Ollie returns most of his key pieces from a 20-10 (10-8 Big East) squad that will no doubt enter next season with a major chip on its shoulder. If the chips fall into place for Boatright and Napier next season, there may not be a better backcourt in America. Only time will tell. What’s good for Duke is good for Team USA? That seems to be the correlation, as SI.com‘s Ben Golliver relates that Mike Krzyzewski‘s original decision to retire as USA Basketball’s head coach was more about reaching another four-year milestone at Duke than it was about international hoops. Basically, Coach K asked himself at the end of the 2012 Olympics whether he felt that he’d still be coaching at Duke in 2016, and at the time, he wasn’t sure of the answer. Since he believes that Team USA’s head coach should be actively involved in the sport — as he put it, “on the firing line” — he thought it would be best to give up the gig. USA Basketball chairman Jerry Colangelo may have sensed Krzyzewski’s eventual 180, as he kept the job in waiting until Coach K decided last spring to return (stating that he is “sure he’s going to coach for a while.”). Given K’s 62-1 record and uncanny ability to get multi-millionaires to play team basketball for the USA jersey, this is a great, great thing. In our sport, summer is the time for testing out new things and the statistical wizardry over at KenPom is no exception. Yesterday the vaunted statistician announced a new metric to his suite of team data points yesterday: average possession length (APL). As always with KenPom, the beauty of this new metric lies in the detail. Tempo is a measure that tracks efficiency, but APL simply tracks how long you are either holding the basketball each possession, or defending the basketball each possession. The 2013 listing is here (subscription required), but as Pomeroy notes, the correlation is already clear in viewing the last four years of data. Great defenses tend to correlate well with high defensive APLs — it’s harder for an offense to find a good shot — which begs the question whether faster-paced offensive coaches may be incentivized to slow things down to make their teams better overall. An interesting intellectual exercise, no doubt. 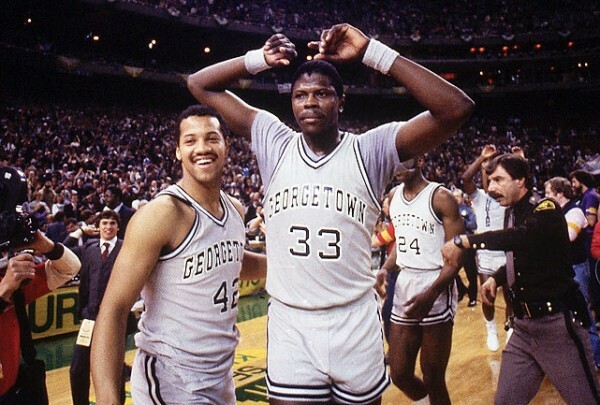 With an upcoming four-part show coming on the CBS Sports Network that will highlight the 16 greatest teams in college basketball history, the guys at CBSSports.com decided to put together their own lists for fans to see. You can see their full ballots laid out here, as voted by Jeff Goodman, Gary Parrish, Matt Norlander, and Jeff Borzello. The show is still a month away from broadcasting, but the discussion has already begun. To make things easier for you, we’ll give a rundown of the consensus rankings they chose, along with some trend analysis about their selections. See above for a readable spreadsheet of the CBS rankings. 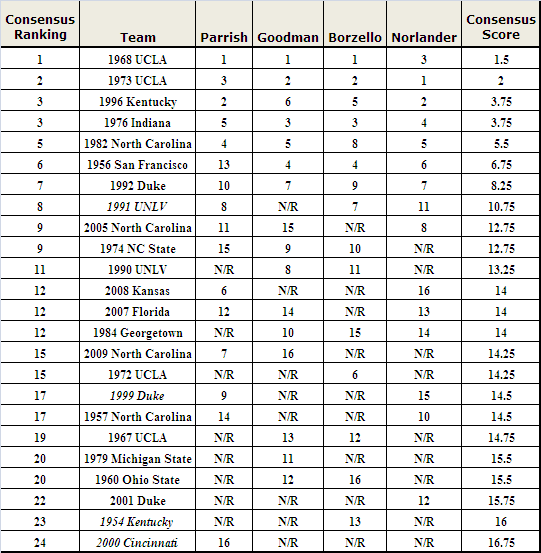 By consensus, the guys rated the 1968 and 1973 UCLA teams as the two greatest teams ever. Hard to go wrong there, as both teams were National Champions as part of the Bruins’ streak of seven consecutive titles. The ’73 team went undefeated in Bill Walton’s junior year, while the ’68 team lost just one game in Lew Alcindor’s junior year, a game midway through the regular season against Houston at the AstroDome in which Alcindor was recovering from an injury. The Bruins got their revenge that season by blowing out Houston in the Final Four by over 30 points en route to the title. The popularity of Alabama’s basketball team might pale in comparison to that of its National Championship football squad, but the boys on the hardwood win its games in a similar fashion: defense, defense, and more defense. So the fact that Vanderbilt showed up in Tuscaloosa on Thursday night with the more physical defensive effort was impressive, especially considering how poor the Commodores struggled on the defensive end just a few weeks ago. Kevin Stallings’ team allowed just 59 points in the road win, and Vanderbilt (14-4, 4-0 SEC) is a much tougher team now with physical force Festus Ezeli back in the lineup. This group is a changed bunch from the team that lost to Indiana State at home in December, and the Commodores must be taken seriously now as a team with the formula to make a run in March. Vanderbilt entered this season a preseason Top 10 team, bringing back all five starters and three NBA prospects in Jeffery Taylor, John Jenkins, and Ezeli. Jenkins has held up his end of the bargain, leading the conference in scoring at 19.8 points per game. He’s arguably the best shooter in college basketball, currently leading the nation in three-point field goals (67) at a 45.3% rate (third in the SEC). Taylor has done his part, too, displaying his all-around game to the tune of 16.9 points, 5.6 rebounds, 2.0 assists, and 1.4 steals per game on 53.6% field goal shooting and the ability to hit from deep (45.3% on 3.5 attempts per game). But Ezeli missed six games due to an NCAA violation-related suspension, and another three recovering from knee surgery, and the Commodores struggled without him. While he doesn’t provide the statistical production of his fellow team leaders, Ezeli is their only true interior threat and most impactful defender. Take away those two aspects, and Vanderbilt barely looked like an above-average team for the first 10 games of this season. Insert the obligatory joke about President Bush’s My Pet Goat attention span, but he always seems to enjoy these meetings with various sports champions. Kansas’s visit yesterday was no different. We’re working on getting a Youtube video up of the event, but for now this link will have to suffice (update – got it below). We think Big Shot Mario should get an agent soon so that he can purchase a suit that fits him. And when did Danny Manning grow to eight feet tall?? So it’s been 39 days since Kansas’ Mario Chalmers thrilled us all with his clutch three-pointer that sent the national title game into OT and crushed the foul-shooting-challenged Memphins Memphians Memphisers what the hell is it Memphis Tigers in the process. That’s just about enough time for our first scandal to arise! Say It Isn’t So, Darrell! [T]ranscripts obtained by News 8 raise questions about whether he was actually making the grade in the classroom during his junior season, specifically in math. Transcripts show Arthur received no grades at all during his fall semester. His final grade was changed to a 70 in September 2005 without an explanation. If, in fact, Arthur had failed math that fall, he would not have been eligible to play basketball, and many of his team’s victories in that championship season might have to be forfeited, according to University Interscholastic League standards. It gets worse, Jayhawk fans. Former South Oak Cliff math teacher Winford Ashmore said Arthur had a history of trouble in math. He showed us his 2002 grade book for freshman math in which Arthur was making weekly failing grades: 45, 25 and 24. Ashmore said then-principal Donald Moten, and current head basketball coach James Mays Jr., both asked him to bypass the rules and award Arthur a passing grade. “Darrell was still failing, and was not making much of an effort in class, and was not coming to tutoring,” Ashmore said. 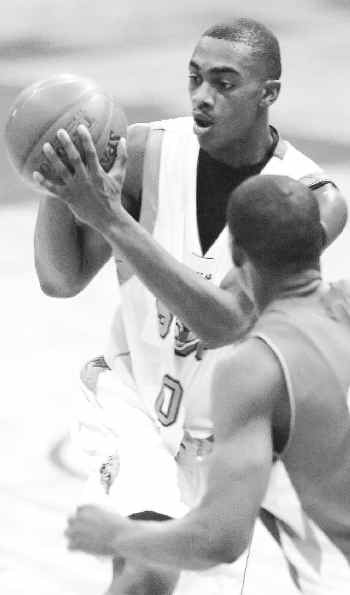 “So at that point I ensured Moten — as well as James Mays Jr. — that Darrell Arthur was going to get an F for the six weeks.” Days later, without teacher approval, Arthur was dropped from Ashmore’s class. And despite those low grades, transcripts reflect Arthur received a passing grade of 70. KU better start hoping that Ashmore (wasn’t he on Fresh Prince of Bel Air?) is a Texas fan with an active imagination. But credibility seems to lie on Ashmore’s side. Principal Moten recently resigned from his post at the high school in light of another grade-changing scandal involving a class subsequent to Arthur’s. The Kansas blogs are strangely quiet on this so far this morning, but maybe they’re still in shock. We know we would be too. After all, if Arthur is retroactively found ineligible, their season could be officially relegated to the trashbin that 1993 Michigan and 1996 UMass find themselves. Except that it’s worse. 2008 Kansas was the national champion, in case you’d forgotten. Where does 2008 KU rank among this decade’s champions? We’d put them higher than seventh but lower than fourth. Brandon Rush is going pro, according to Yahoo Sports. What an amazing silver lining for Rush and KU after he blew out his knee during NBA workouts last spring. As a mirror question to the one floated about One Shining Moment below, is there anyone alive who actually likes Billy Packer? More blowback on Roy’s Kansas decal last night. And here. Arizona’s Chase Budinger will test the waters of the NBA Draft, joining teammate Jerryd Bayless from last week. In a bit of a surprise, Florida’s Marreese Speights (14/8) will also test the waters of the draft. When does that two-year rule start again? LSU’s Anthony Randolph will also be testing the waters. After not playing in the entire 07-08 season due to an injury, Alabama’s Ronald Steele is also putting his name into the draft. While not official at this point, reports are indicating that Kansas St.’s Bill Walker will also declare for the draft soon.